I’ve received several comments on The Simple Leader, with some of the most unexpected having to do with the section where I discuss my desire to design and build a home with Lean principles in mind. If I hadn’t studied chemical engineering I probably would have gone to architecture school – it’s been a passion of mine for decades. For the past several years I’ve been looking for the ideal piece of property to build on, but nothing has been the “right” one. 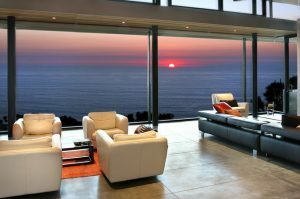 In the meantime I’ve remodeled every room of our current house, but although we have a nice ocean view and the fixtures and amenities are perfect, it still has issues. 1940s house, many rooms, many halls, many doors. Barriers to simple, minimalist, meaningful living. Not to mention lots of maintenance. Still, I couldn’t resist designing the ideal residence, so I worked with an architect friend of mine on several ideas. Then, just a week ago, an existing home came on the market all of two blocks from us that has nearly ideal bones, and we’re now in escrow. Incredible unblocked views of nearly twenty miles of California coastline and our small fishing village of Morro Bay, privacy from nearby homes, and a simple layout that can be changed into what we want. So the plan has changed from a ground-up build to an extensive remodel of a current home with the right fundamental characteristics. As I describe in my book, we almost bought a much larger home several years ago near the peak of the housing bubble. Thankfully it didn’t happen when the bidding went above our price, which helped us think about our true needs – one of which was less space. This flies in the face of traditional thought where as you improve your financial situation you generally go larger – whether you need it or not. In our case we began to embrace a minimalist lifestyle, requiring less and less space. Remember that minimalism doesn’t mean doing without – it means ensuring that everything has true value and getting rid of the rest. Nine years ago I wrote a post on how my desire for less storage space created a conflict with my mother in-law, and eventually some puzzled looks on the faces of real estate agents. I now believe in this idea more than ever. Storage space, like extra space in a factory or home, has a tendency to get filled – whether needed or not. Back in the days when companies regularly moved me from place to place I had several boxes that hadn’t been opened over two or even three moves. Value? I ended up simply tossing them, sometimes without even opening. So as part of the remodel of our new home, we are removing many extra and unnecessary cabinets, especially including a monster entertainment center. The kitchen, closets, and bathrooms are being remodeled with minimal cabinet space. 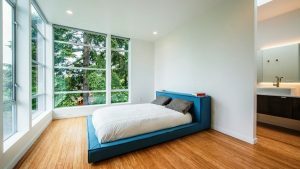 Yes, this could affect the resale value since most people believe storage space to have value, but I’m hoping we’re in this home for a long time – perhaps forever. One of the problems with our current home is that there are several rooms on two levels, plus a detached garage. We’re on a corner lot, on a hill to boot, so the easiest path from the kitchen to the trash bin is out the front door, around the corner and down the street, and into the garage. Really. To get anywhere in the house there are usually two or three doors and a flight of stairs involved. Single level living simplifies flow right off the bat, and that’s one welcome characteristic of the new house. One challenge my architect friend and I often worked on was to see how few doors, walls, and corners a house could have. Bathrooms obviously need privacy, but for other spaces there are ways to create segregation without significantly disrupting flow. For example, removing line-of-sight but without disruption of walls or the feng shui poison of sharp angles can be accomplished with curved walls. No, I’m not designing a factory, but I’m using some lessons from when I did help design a large manufacturing facility several years ago. Spaghetti diagrams help locate processes and functions to minimize walking and transportation. Our garbage cans will now be just a few steps from the kitchen, with just one (necessary, due to fire regulations) door in the way. Doors themselves are interesting. 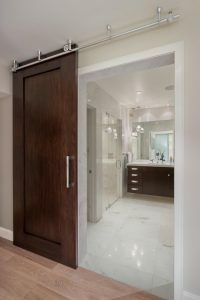 A traditional swing door creates considerable non-usable space. Because of this I’ve become a fan of pocket doors, although they can be a nightmare if maintenance is ever necessary. There’s a recent trend toward the similar barn door concept, which is something we’ll be using in the new house. Barriers to flow are also barriers to communication – visual and otherwise. Although I’m not a big TV watcher, I’m a big fan of flat screen TVs. Perhaps some of you still remember its predecessor, the monster tube TV… with the big flat surface on top. Inevitably stuff would get stacked on top. Clothes on the bedroom TV, magazines on the living room set, and so forth. Flat screen TVs changed all that, hence why I’m a fan. I’ve never liked the impact that horizontal surfaces can have on clutter when, ahem, everyone in the household isn’t as steeped in the power of 5S as I am. Because of this I’ve tried to remove as many horizontal surfaces as possible from my ideal home, and will in the remodel as well. No flat surface in bay windows, only the necessary counter space in the kitchen, and no extra chairs in the bedroom. If I was the boss even the counters would have an angle on them – flat enough so work could be done, but vertical enough that nothing could be stored on top. The real boss is probably right, though, that there would soon be sliced fruit and wine on the floor. But you get the idea. 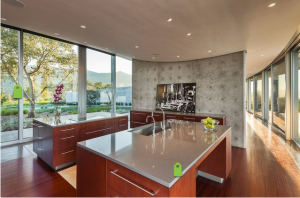 We’ve seen many homes that have the largest washers and dryers, multiple ovens in “chef’s kitchens,” and so forth. Why? Are they really necessary? I can see a large lawnmower if you have a large yard, or large washers if you have a large family. But for two of us? If we entertain, it’s probably just another couple. So we need a small washer and dryer, just one oven, and I have come to like the dish drawer concept. 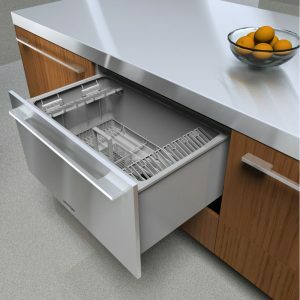 Instead of waiting to fill a standard size dishwasher over the course of a week, generally creating some odor in the meantime, a day or two’s worth can be washed almost on demand. As an aside, I’m personally a fan of washing dishes by hand anyway. It’s a classic mindfulness exercise, being aware of each dish and each activity to clean the dish, and provides some time for reflection. I’m sure it’s similar for fans of gardening and other activities. In our current house I replaced the old huge hot tub with a small wooden soaking tub built for two – max. I’ve loved it. From a maintenance standpoint I used a UV unit so I wouldn’t have to worry about the regular chemical treatment nightmare of traditional tubs. Perhaps some appliances aren’t necessary at all. Do you really use the bathtub in the master bath? We don’t, so out it goes so we can have a larger walk-in shower – which is more valuable to us. We’ll keep the tub/shower combo in the guest bath. How many of you in factories have taken a similar lean approach, replacing a single large press with multiple smaller (and flexibly redundant) presses, and so forth. Same concept. Minimize the monuments. So there are some concepts for starters. How much space and support equipment capacity do you really need? How can you configure that space to remove barriers and waste? Can you reduce waste and clutter by minimizing the opportunities to create it in the first place? There is value in living simply, but living simply does not necessarily mean removing luxuries if they truly add value. I’ll now get back to the fun of planning a big remodel. Besides the kitchen, closets, and bathrooms, we’re replacing all the windows on the ocean side with floor-to-ceiling glass, refinished deck, new garage door, and possibly a new EPDM roof. Whew!